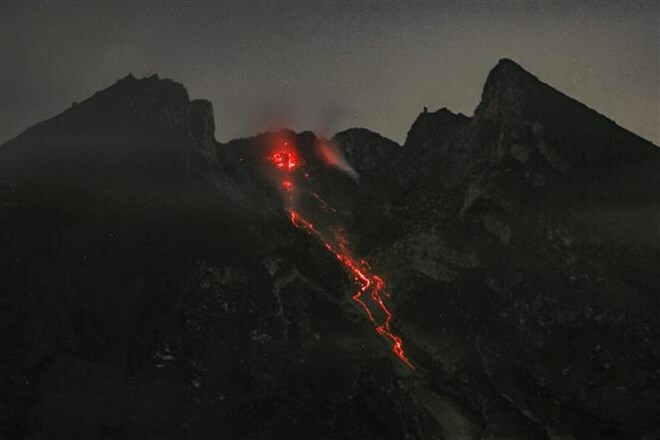 Jakarta (VNA) – Mount Merapi in Yogyakarta, Indonesia released a hot cloud of avalanches on March 28, with a sliding distance of up to 1,250 m toward Gendol river, according to the Center for Research and Development of Geological Disaster Technology of Indonesia (BPPTKG). From midnight to 6 am local time, the BPPTKG recorded some minor earthquakes. During the period, the crater smoke was observed to be white with moderate intensity and 25 m high above the crater of the volcano. Until now the BPPTKG has maintained the status of Mount Merapi at Level II and called on people to stay vigilant. The agency has urged residents to not carry out activities within a 3-km radius from the summit of Mount Merapi and temporarily recommended against conducting climbing activities, except for the purposes of investigation and research related to disaster mitigation.